Decided that I’d like to try a brick: preferably turbo, preferably auto, preferably an estate. I’m Scottish so I figure it’s allowed even if I’m currently south of the border. I’ve always wanted a pez turbo and I’ve yet to have one, and I’ve always fancied tinkering with boost valves and ecu’s to get some free horses, apparently you can get 200hp out of these without too much bother. Having got 50mpgs out of the Skoda for a while, I figure I can get 25mpgs out of one of these and still average 37.5mpg overall.. not bad huh? Anyone know of one for sale, or have any thoughts on the matter? Highly recommend. I swear by them and have had old Volvo’s almost my entire driving career, got my first at age 18! They’re very very good cars, bullet proof reliability and strong old workhorse’s. Though, particularly early 700 models they can feel a bit dated in the way they drive now if your used to more modern stuff. Early 700’s imho are the best lookers but they’re starting to become scarce now as they’re well on the way to being at least 30 years old by now. Later 900’s are better built and equipped though. I’ve had my current one nearly 3 years now, an early flat front 740 2.3GLE auto estate. That’s my ideal preferred spec tbh but I was given it for free, got it back on the road again after it’d sat rotting on a driveway and it’s been faultless really since. 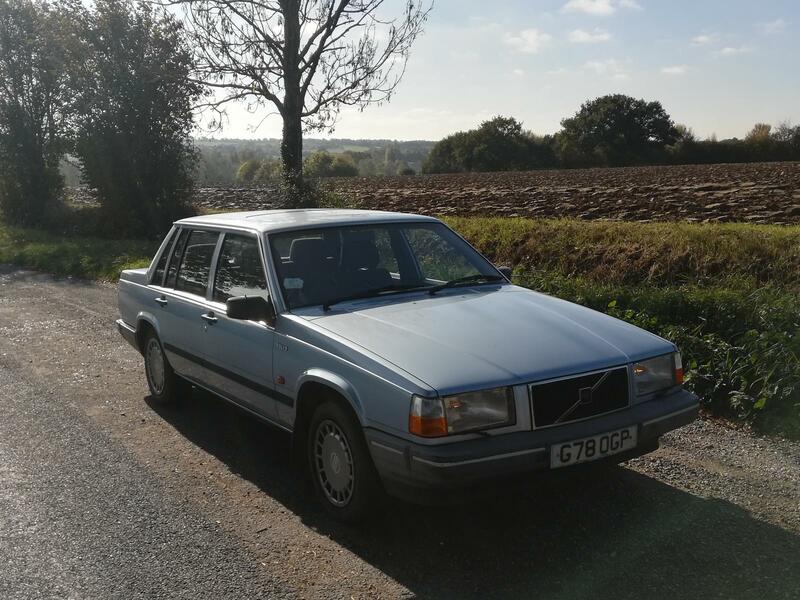 Before this one I had a flat front 740 saloon in the same spec which was a beautiful car and, again was faultless the entire 8 years or so I had it. I must say though I wouldn’t buy one if mpg concerns are a big issue though! I enjoyed the ex-6cyl 740 estate, 2.3 auto. Would I have another, yes, but turbo next time, it was a tad ponderous. I replaced it with a 405 estate, smaller load space but just as comfy and a nicer car to drive. I still regret not buying Maister_Fowler's old 760 turbo. There might be a spare Volvo estate up for sale once Bucketeer takes off pedalling. There’s 2 estates (J reg and K reg) sat on a driveway near where I live along side a Skoda. One red one blue, the red one has been sat there many years and has some huge lumps of moss growing on its roof! The blue car looks good though. There was a sign on them saying ‘possibly for sale, knock door for info’. I did think about having them both a while back, making one good car out of two but, being 900’s you can still pick up good roadworthy cars for so little it’s probably not worth it unless you want a project. If you find one and want someone to pop over with you to have looks just give me a shout. Plus you’re a bad influence. Thanks for the pointers everyone..
Well spotted. Is that a turbo? I might know of one in mid Wales a 940 2.3 turbo estate, possibly actually a manual, it's road legal, don't know much else, want me to make further enquiries? I shared a 940GLE saloon on the eBay that thread yesterday..
Wasn't The Old Bloke Next Door trying to shift a 940? I seriously recommend it, my 740GLE was ace. Mine isn't an estate or a turbo but it's great. My first Volvo and now I'm converted, wouldn't want anything else. Everything you want and nothing you don't need. All of my 740/940 Volvo's have been bloody brilliant. I've had 240, 740 and 940, and my favourite of the three was the 740, a GLE estate in 2.3 auto flava. Pretty much a perfect car, says the man who owns his third Cadillac and covets another Jag. Ive just bought one from “Old Bloke Next Door” and I think I’m in love. I forgot how nice they are! Maybe it's the 940 I've got (which does have a few issues) but it is a bit meh. I love my 940 to the extent I'm constantly trying to find a way to justify buying another. Great cars and they really do feel like they're built to last, check very carefully under the carpets for rot/water ingress though! I've had a couple of diesel 940s, they're a bit rubbish but make a great noise, I don't think I'd enjoy a 4 pot petrol one to the same extent. They're a bit plodding to drive but really comfy. That looks to be a decent buy, asking price probably about right IMO.